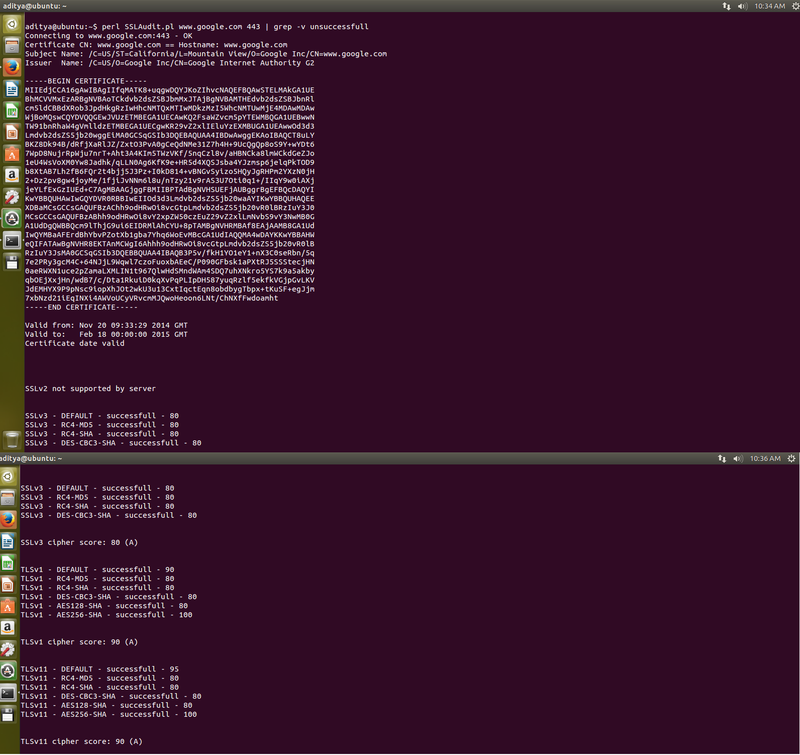 Just performs a handshake with the list of JSSE ciphers with the SSL server. If handshake is successful it marks it as a success. This is more of a test for Java based SSL clients which use JSSE for SSL/TLS communication. This code relies heavily on the underlying implementation provided by Java JDK/JSSE. Use it with 1.7 as a lot of cipher support has been added. As I mentioned, this is not a true SSL cipher scanner, because it depends on what ciphersuites have been enabled by JSSE. The server might support other ciphers that are not yet implemented by JSSE, but they wont turn up in the results. Actually if you can read from the raw SSL handshake packets, you can understand what the server SSL supports, you do not need java implementation for that. private static final String jsseCiphersDisabledByDefault = "TLS_DH_anon_WITH_AES_256_CBC_SHA256:TLS_ECDH_anon_WITH_AES_256_CBC_SHA:TLS_DH_anon_WITH_AES_256_CBC_SHA:"
private static final String jsseCiphersEnabledByDefault = "TLS_ECDHE_ECDSA_WITH_AES_256_CBC_SHA384:TLS_ECDHE_RSA_WITH_AES_256_CBC_SHA384:TLS_RSA_WITH_AES_256_CBC_SHA256:"
//A lot of them are not yet supported on jsse, See Note 1.
private static final String jsseCompleteCipherList = "SSL_DH_anon_EXPORT_WITH_DES40_CBC_SHA:SSL_DH_anon_EXPORT_WITH_RC4_40_MD5:SSL_DH_anon_WITH_3DES_EDE_CBC_SHA:"
System.out.println(ciphers + ":" + e.getClass() + " "
System.out.println("Testing " + version + " ciphers. Count: "
System.out.println("Successful Handshake count = "
So, as an example, when I check, I see that my eclipse is still using 1.6 for execution. So I need to change it to 1.7 to destroy these ugly exceptions. :D. You can check the page for JSSE 7.
http://docs.oracle.com/javase/7/docs/technotes/guides/security/jsse/JSSERefGuide.html and see the values for SSLContext. Changed to 1.7. Cannot support exceptions again point to the use of an incorrect JRE like 1.6. However, unsupported exception (that you can get while using 1.7) might mean that the ciphersuite is still not implemented in JSSE 1.7. I am trying to gather some freely available tools, techniques and links that can help running SSL/TLS related tests. The more I learn, the more stuff I will add. SSL/TLS is not that simple, you cannot rely on the output of just 1 tool. You also need to understand how that tool/script works internally. Testing might be affected with what openssl version you have installed, because older versions may not have support for newer cipher suites or higher protocols. So while testing you need to take this into consideration. ssl_tests is a shell script that uses sslscan and openssl internally to connect. 6. TestSSLServer : A simple java program that does the same kind of testing. The program uses plain sockets and raw packet level inspection and does not depend on any provider like JSSE or Openssl as such. So it is very good for learning at raw packet level as to how do you know whether compression is supported or not. The program also checks CRIME and BEAST status by checking the compression support in the connection and inspecting the protocol version. You can see how it does that in the comments. However, I would recommend you develop your own understand about CRIME/BEAST working and its latest status depending on your own application implementation rather than relying on the output of the testing program. Things and assumptions keep changing with time. It is a windows based tool. However, it does not have support for a lot of latest ciphers probably because it has not been updated. 8. If you want to play around writing your own tool, here is a small test I did in Java. This tool is an example of how you can use a crypto library for SSL testing. The drawback is that you can only test the cipher that your client library supports. In contrast to TestSSLServer (6) which does a packet level inspection and does not rely on a local crypto library. 9. Testing the SSL for mysql and postgresql? I found SSLAudit pretty good. [*] Explains a lot of common SSL problems in a very simple way.